When I first tried rail travel as an alternative to flying, it was something of a revelation. No airport queues, tedious transfers or long drives. Instead, a more relaxing, scenic and sustainable journey that felt like the holiday had begun. Surprisingly, too, daytime travel takes little more time than flying, when compared door-to-door. Once I’d persuaded my friends to try the train, they never asked about flying again. However, I recently made a discovery about a different way of travelling to the slopes by train. From leafing through a copy of the European Rail Timetable (geeky, I know) I realised how many fast TGV trains leave Paris each morning bound for the Alps. You can’t start out from London the same day and catch these trains, but if you head to Paris the night before and stay over in a hotel there, you can. By doing this, you have a lovely relaxed journey, get to see a bit of Paris if you want, and get to resort earlier, while most skiers are still travelling. In many cases, arriving in resort for midday means that you can spend a cheeky extra afternoon on the slopes, too. 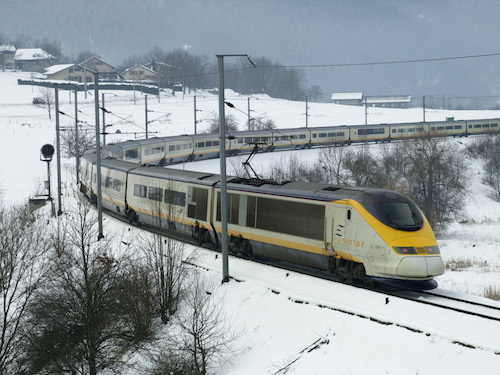 For skiers with holidays starting on a Sunday in the popular Tarentaise region of the French Alps, stopover journeys are particularly useful because there is no Sunday-to-Sunday daytime Eurostar Ski Train service. When I tried this with friends, it was a challenge to persuade them that spending even more time travelling was a good idea. But they soon rallied around the concept when they realised that they’d get to see Paris and get to the slopes in time for a ski in the afternoon. We crossed Paris by pre-booked taxi, which made things very easy, and our hotel was 200m from Gare de Lyon, with plenty of nearby restaurants to choose from for dinner. I filmed our journey, which you can see here. There are so many TGV trains that leave from Paris, and this kind of journey is viable for a variety of resorts in France, Switzerland, Italy and Austria. Below, I’ve included some great resorts you can reach travelling this way. Depart from London St Pancras to Paris Gare du Nord by Eurostar (choose your most suitable train time) and stay over in Paris; next morning take the 07:11 TGV from Paris Gare de Lyon, arriving at Cluses at 11:05; from there it’s 25 minutes by bus or taxi. Depart from London St Pancras to Paris Gare du Nord by Eurostar (choose your most suitable train time) and stay over in Paris; next morning take the 07:41 TGV from Paris Gare de Lyon, arriving at Grenoble at 10:42; or the 09:45 TGV, arriving 12:46; from there it’s 50 minutes by bus or taxi. Depart from London St Pancras to Paris Gare du Nord by Eurostar (choose your most suitable train time) and stay over in Paris; next morning take the 07:11 TGV from Paris Gare de Lyon, arriving at Cluses at 11:05; from there it’s 50 minutes by bus or taxi. Depart from London St Pancras to Paris Gare du Nord by Eurostar (choose your most suitable train time) and stay over in Paris; next morning take the 06:29 TGV from Paris Gare de Lyon, arriving at Oulx at 11:23; or the 10:41 TGV, arriving 15:43; from there it’s 50 minutes by bus or taxi. Depart from London St Pancras to Paris Gare du Nord by Eurostar (choose your most suitable train time) and stay over in Paris; next morning take the 06:29 TGV from Paris Gare de Lyon, arriving at Modane at 10:48; or the 08:27 TGV, arriving 13:07; from there it’s 30 minutes by bus or taxi. Depart from London St Pancras to Paris Gare du Nord by Eurostar (choose your most suitable train time) and stay over in Paris; next morning take the 06:49 TGV from Paris Gare de Lyon, arriving at Landry at 11:38; or the 07:49 TGV, arriving 12:39; or the 09:49 TGV, arriving 14:38; from there it’s 15 - 30 minutes to the resort’s villages by bus or taxi. Depart from London St Pancras to Paris Gare du Nord by Eurostar (choose your most suitable train time) and stay over in Paris; next morning take the 07:23 TGV from Paris Gare de Lyon to Zurich, change there and take the 12:40 RailJet train, arriving at St Anton at 15:03. Depart from London St Pancras to Paris Gare du Nord by Eurostar (choose your most suitable train time) and stay over in Paris; next morning take the 06:49 TGV from Paris Gare de Lyon, arriving at Bourg St Maurice at 11:48; or the 07:49 TGV, arriving 12:51; or the 09:49 TGV, arriving 14:48; from there it’s 45 minutes by bus or taxi. Depart from London St Pancras to Paris Gare du Nord by Eurostar (choose your most suitable train time) and stay over in Paris; next morning take the 06:29 TGV from Paris Gare de Lyon, arriving at Oulx at 11:23; or the 10:41 TGV, arriving 15:43; from there it’s 25 minutes by bus or taxi. Depart from London St Pancras to Paris Gare du Nord by Eurostar (choose your most suitable train time) and stay over in Paris; next morning take the 06:49 TGV from Paris Gare de Lyon, arriving at Bourg St Maurice at 11:48; or the 07:49 TGV, arriving 12:51; or the 09:49 TGV, arriving 14:48; from there it’s seven minutes by funicular railway to Arc 1600, with bus connections to the other villages; you can also travel by bus or taxi (35 – 45 minutes) from Bourg St Maurice to all the villages.